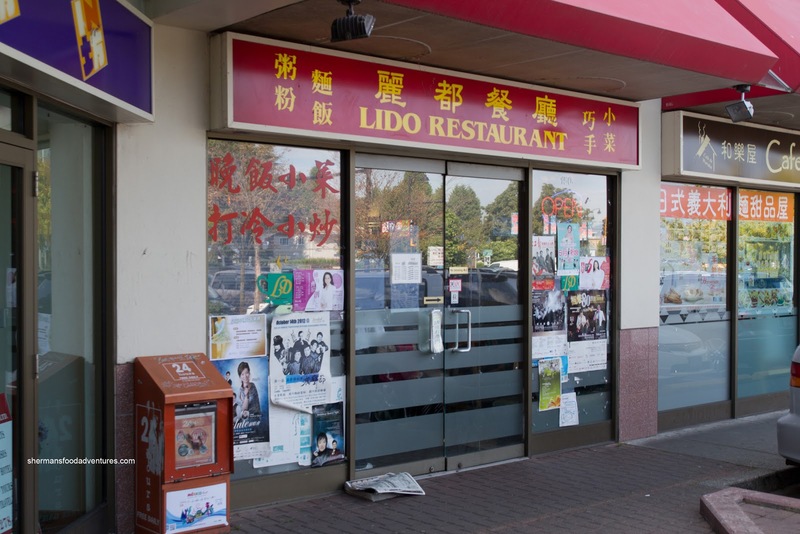 "The best Bo Loh Bao in the city" is Lido's claim to fame. So how is it that I've never blogged about it? Furthermore, being my son's favourite food, why have I not gone? Those are some pretty legit questions. Well, it's not like we haven't tried... Each time, they ran out! Are they that good??? Well, I was about to find out as we visited Richmond for the 2nd straight weekend. Now, we all know about the adventures in parking which usually afflicts every visit to Richmond. Since Lido is located in a plaza which severely lacks enough parking spots, it creates a real dilemma: park at Aberdeen or Parker Place? It's like choosing between listening to Justin Bieber or One Direction... Well, at least for me it is... So we decided on Aberdeen for no other reason than there was no good choice! 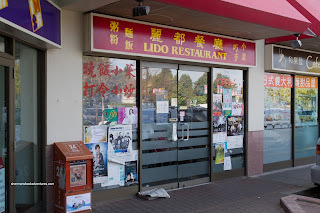 We walked over to Lido and luckily, didn't have to wait long for a table. I decided to go for a set meal which included Borscht. 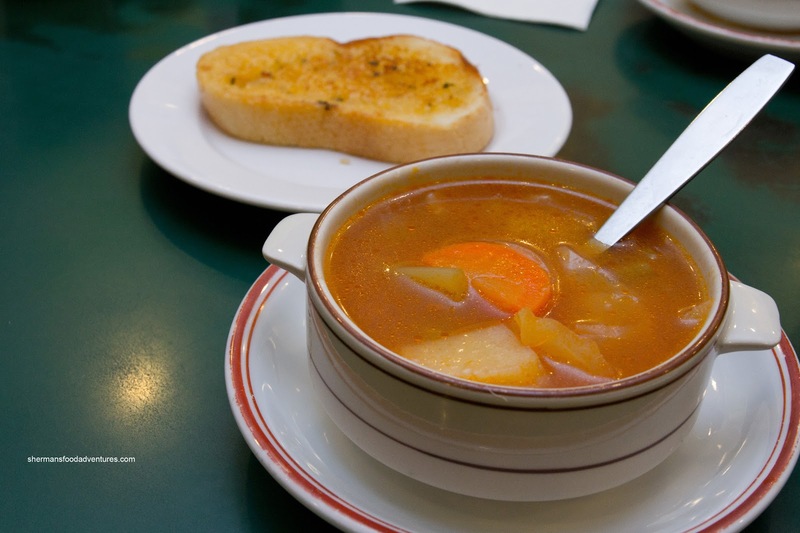 Now if you are familiar with HK-style cafes, you will know borscht stands for vegetable soup. Yet, it was a relatively thin-tasting vegetable soup. 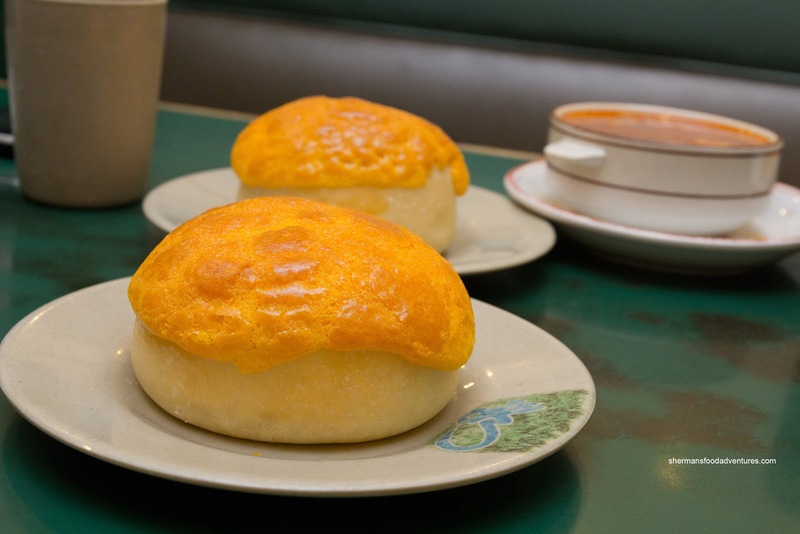 And (drum roll please) ta da - the Bo Loh Bao (or Pineapple Buns). So are they the best in the city? I would say "yes" with an asterisk. Why? Well, they are served fresh and hot out-of-the-oven, so naturally they would be "better" than most places (that have them sitting around). With that being said, they were pretty darn good. The quality of the dough was apparent as it was soft and light. The crispy topping was substantial, yet not overbearing. It wasn't too sweet either. My son loved it. Since he's the bo loh bao expert in the family, I'll let him declare they are the best. What can make it even better (to some) is to add a slice of butter. 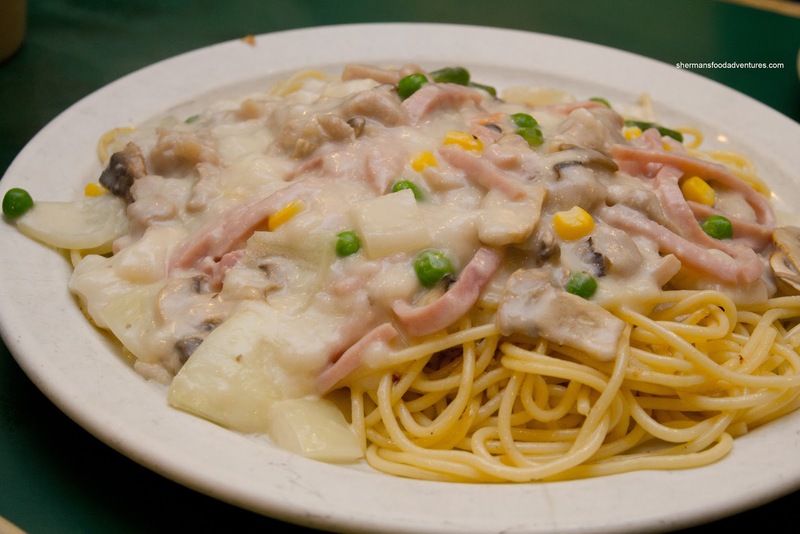 And as greasy as butter, the Shredded Chicken and Ham Spaghetti with Cream Sauce slid down our throats ever-so-easy. Except, the cream sauce was clumpy and overly thick. This was not a very well-executed dish. In fact, it was rather gross where the sauce resembled somewhere between snot and... (not gonna even mention it, you use your imagination). For my main, I had Three Meats that included Tripe, Curry Brisket and Ox Tongue. 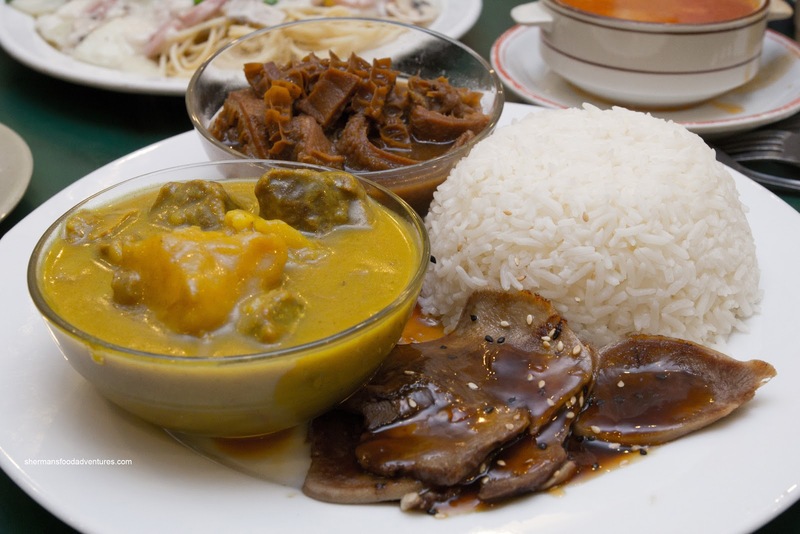 The tripe was overdone and salty while the ox tongue was razor-thin, dry and oversauced. The one saving grace was the curry brisket where the beef was tender while the sauce was coconutty and thick. As you can see from my small sample size, the bo loh bao was the highlight (and quite possibly the only highlight). However, it is enough for me to return.